Not only are these Whipped Sweet Potatoes with Red Curry and Coconut Milk extremely eye catching on a dinner table – they are also irresistible! Something about the exotic tastes of red curry and coconut milk spice up an average mashed sweet potato into something really special for the holidays. We all agreed that eating them in the same bite with the pork made a really interesting combination – and I think it would pair just as well with a Thanksgiving Turkey. I’ll admit, there a couple steps in this recipe but nothing terribly daunting. I used my food mill to puree the potatoes until extremely smooth (despite my love-hate relationship with the gadget). If you don’t have a food mill, just use a stand up mixer. You can also make these in advance (up until they are in the ramekins) and then bake off right before you’re ready. A crispy onion garnish is really essential. The salty crunch really hits the spot. Instead of making my own (what a pain! ), I bought Lars Crispy Onions at The Fresh Market. And, I found a friend sneaking more of them on his sweet potatoes mid-dinner! They are worth it! Enjoy this recipe this holiday season. It’s impressive and simple – interesting and appealing! Yum! Heat the oven to 350 degrees. Wash sweet potatoes and pierce with a fork. Put them on a cookie sheet and roast for an hour and a half – or until knife tender. Allow to cool and peal away skin. Meanwhile, heat coconut milk on the stove. 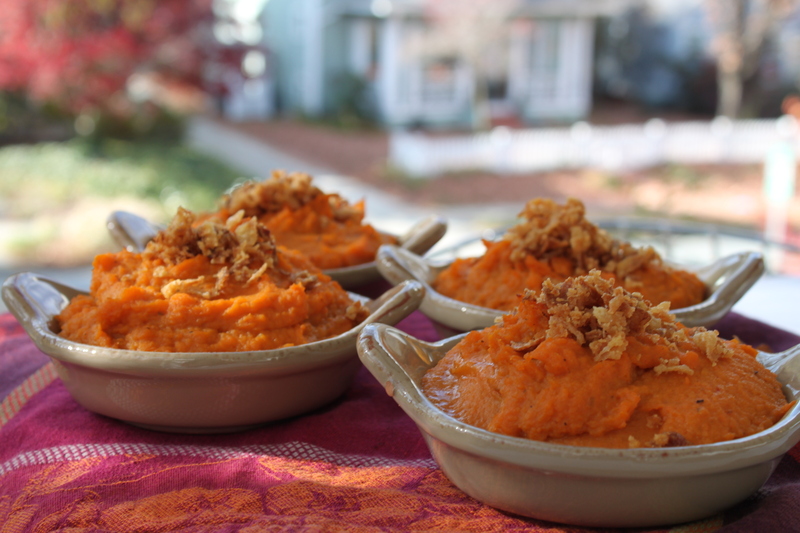 Using a food mill or stand-up mixer, whip or puree sweet potatoes until smooth. Add the pureed sweet potatoes into a heat-proof bowl and set over another bowl simmer water. This will warm the potatoes back up to incorporate other ingredeints. Slowly stir in coconut milk, red curry paste and brown sugar. Taste for seasoning! The potatoes will need a generous amount of salt! Add pepper and butter. The potatoes should be sweet and salt, smooth and luxurious! Turn the stove to 400 degrees. Add potatoes to individual ramekins and place back onto the cookie sheet. Bake until hot and potatoes are starting to brown just slightly. Serve warm with a crispy onion garnish!